Dear Berlin New Municipalism Activists! Your are invited to help shape and participate in the EXPERIMENTDAYS.18! and Werkstatt am Haus der Statistik, Alexanderplatz. and finally another round of EXDAYS presentations and discussions will be at the RAW in November. It has been proposed that the ‚Munizipalistische Plattform‘ get together for a public discussion at the RAW, on Sunday, November 11. This could include evaluations and summaries of 2018 initiatives and events, including EXDAYS, urbanize!, Community Land Trust Initiatives, Mietendemos, Make City, etc. etc, with the goal of making proposals for 2019! Please let us know if you have any questions or suggestions! 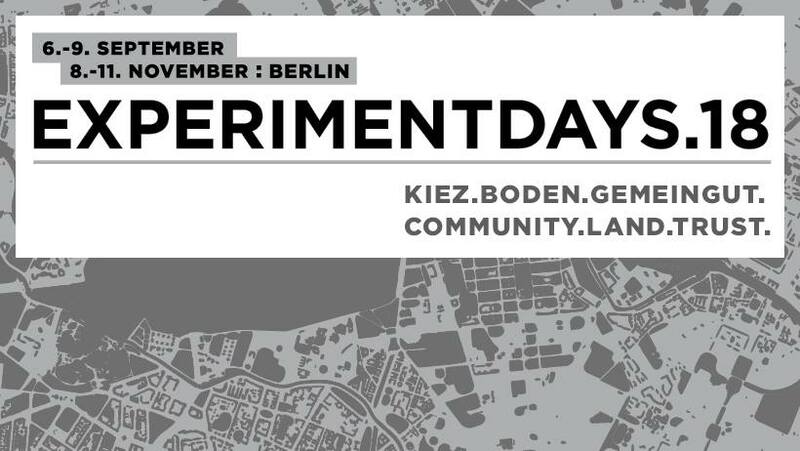 We are asking everyone to register for the workshops, through the web site experimentdays.de. id22: Institut für kreative Nachhaltigkeit / Institute for Creative Sustainability e.V.